Abstract. Reconstructions of past climatic changes from borehole temperature profiles are important independent estimates of temperature histories over the last millennium. There remain, however, multiple uncertainties in the interpretation of these data as climatic indicators and as estimates of the changes in the heat content of the continental subsurface due to long-term climatic change. One of these uncertainties is associated with the often ignored impact of the last glacial cycle (LGC) on the subsurface energy content, and on the estimate of the background quasi steady-state signal associated with the diffusion of accretionary energy from the Earth's interior. Here, we provide the first estimate of the impact of the development of the Laurentide ice sheet on the estimates of energy and temperature reconstructions from measurements of terrestrial borehole temperatures in North America. We use basal temperature values from the data-calibrated Memorial University of Newfoundland glacial systems model (MUN-GSM) to quantify the extent of the perturbation to estimated steady-state temperature profiles, and to derive spatial maps of the expected impacts on measured profiles over North America. 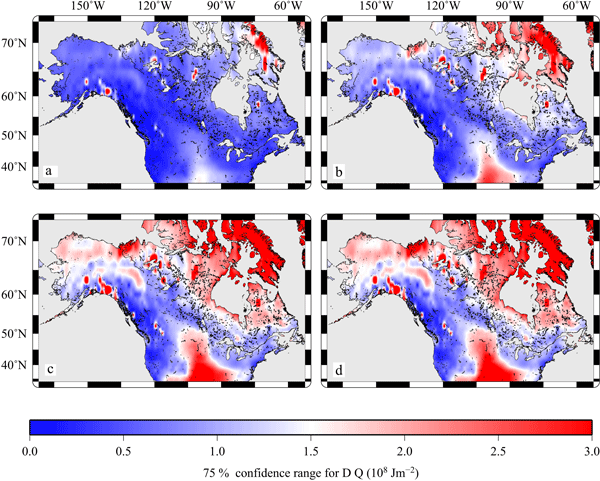 Furthermore, we present quantitative estimates of the potential effects of temperature changes during the last glacial cycle on the borehole reconstructions over the last millennium for North America. The range of these possible impacts is estimated using synthetic basal temperatures for a period covering 120 ka to the present day that include the basal temperature history uncertainties from an ensemble of results from the calibrated numerical model. For all the locations, we find that within the depth ranges that are typical for available boreholes (≈600 m), the induced perturbations to the steady-state temperature profile are on the order of 10 mW m−2, decreasing with greater depths. 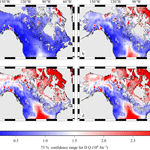 Results indicate that site-specific heat content estimates over North America can differ by as much as 50%, if the energy contribution of the last glacial cycle in those areas of North America that experienced glaciation is not taken into account when estimating recent subsurface energy changes from borehole temperature data. How to cite: Beltrami, H., Matharoo, G. S., Tarasov, L., Rath, V., and Smerdon, J. E.: Numerical studies on the Impact of the Last Glacial Cycle on recent borehole temperature profiles: implications for terrestrial energy balance, Clim. Past, 10, 1693-1706, https://doi.org/10.5194/cp-10-1693-2014, 2014.